13/12/10 – Acquisition – Montpellier, Musée Fabre – In November 2010, the Musée Fabre purchased a beautiful painting by Giovanni David, Tobias Burying the Dead (ill. 1) from the Michel Descours Gallery in Lyon. This artist from Genoa, who died at 41, was a student of Domenico Corvi in Rome where he arrived in 1770. An engraver and theatre decorator (he worked notably at the Fenice), David also produced canvases of gothic inspiration, particularly influenced by Füssli whose works he might have seen in Rome where the Swiss artist lived between 1770 and 1778. The painting acquired by Montpellier  corresponds to this vein, both by its funereal subject as well as its luminist and fantastic treatment. It falls therefore under the Sublime current, highlighted in the exhibition now showing at the Louvre, L’Antiquité rêvée. We would like to say a word here about the exhibition on European Neo-Classicism at the Michel Descours Gallery in Lyon which we unfortunately could not see although we read the catalogue written by Mehdi Korchane. 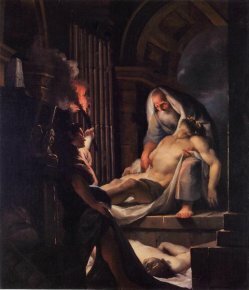 Tobias Burying the Dead by Giovanni David is presented along with many other interesting works. The catalogue opens with a large unpublished work by François-Guillaume Ménageot. 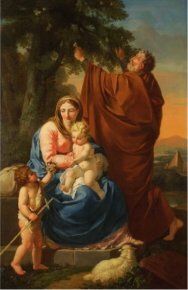 It represents The Rest during the Flight into Egypt with Saint John the Baptist as a Child (ill. 2) and its style is very close to that of Pompeo Batoni. 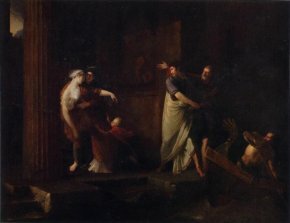 There is also a notable Brutus and Porcia Bidding Farewell from the Salon of 1799 (ill. 3), a rare painting by Antoine Dubost, whom we mentioned in discussing a painting of his held in Bombay (see news item of 30/8/06 in French) as well as the discovery of a canvas presented for the Prix de Rome of 1801, finally awarded to Ingres. 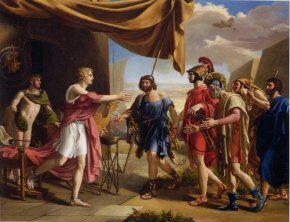 This Achilles Welcoming Agamemnon’s Ambassadors by the German painter Gottlieb Schick (ill. 4), a student of David, was assigned third place in the contest. Galerie Michel Descours, 44 rue Auguste Comte, 69002 Lyon. Tel : +33 (0)4 72 56 75 97. The exhibition runs from 2 December 2010 until 8 January 2011. It appeared at auction on 18 June 2008 at Sotheby’s Paris.